Product #20635 | SKU 3I-4217-18T | 0.0 (no ratings yet) Thanks for your rating! 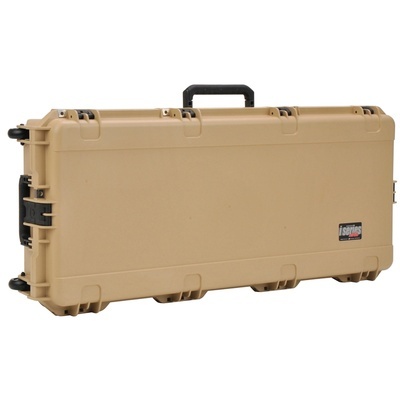 The tan SKB iSeries Waterproof Acoustic Guitar Case with Wheels accommodates most dreadnought and auditorium size guitars. It is constructed of ultra high-strength polypropylene copolymer resin and features a gasketed, waterproof, submersible design (IP67) that is resistant to corrosion and impact damage. Its moulded-in hinges, trigger release latch system with TSA recognised and accepted locks, 4 reinforced locking loops for customer supplied locks, comfortable, snap-down rubber over-moulded cushion grip handles, secure stacking, and automatic ambient pressure equalisation valve (MIL-STD-648C) all contribute to its military-grade design. The plush interior provides total neck support and protection on all sides.